Just today, I found myself wandering around the store with my two little kids. It was close to nap-time, my kids hadn’t eaten lunch, and they did NOT want to be at the store. 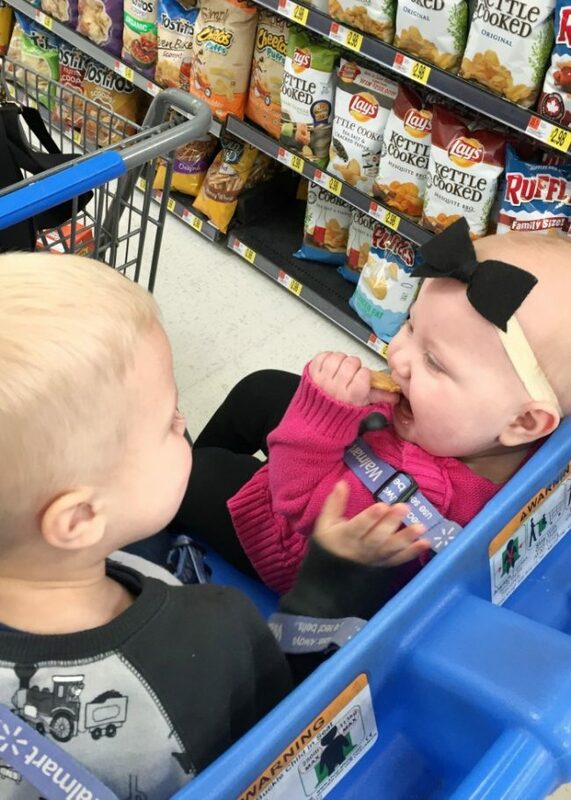 My daughter kept switching from the front seat to the back seat of the cart, wouldn’t keep her shoes on, and my son was running up and down the aisles knocking items off the shelf. I found myself kneeling on the ground cleaning up his mess only to glance up at my daughter who had opened the packaging for her new chore chart and was putting stickers (that we hadn’t paid for yet) all over her body. These kind of moments make shopping with little kids so stressful. Find yourself in the same boat? 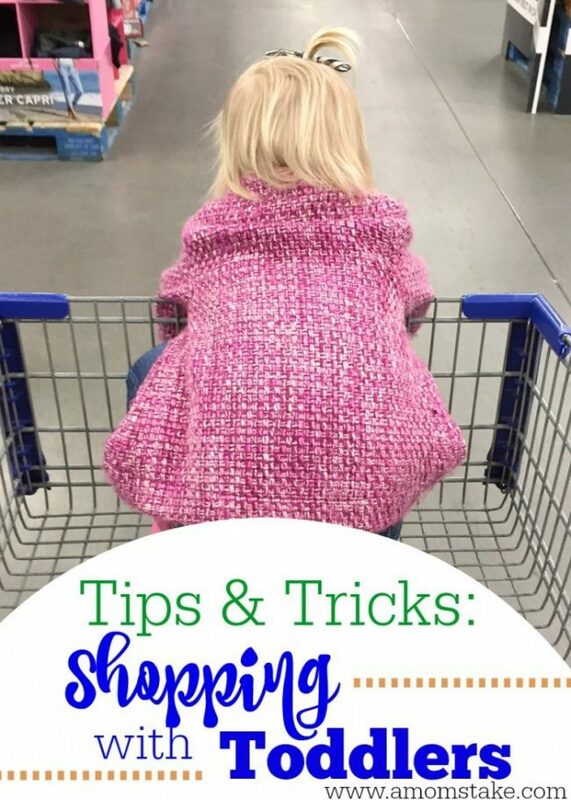 These little tips and tricks for shopping with toddlers will save you! Be prepared. The more I prepare for my shopping trips, the smoother they typically run. Prepare a grocery list, feed your kids before, take them to the bathroom right when you get to the store, choose a time of day when they won’t be tired, pack snacks, etc. Basically prepare for the worst, and you’ll be pleasantly surprised 😉 I’ll never forget the time I finally completed a large grocery trip (with my two kids) only to realize I hadn’t brought my wallet to the store. Preparation makes all the difference! Make lists: Bring a pad of paper and a pencil. Draw items for your child to check off their grocery list, or have them draw pictures of items they see at the store. Play I Spy: My kids play this ALL of the time. The possibilities at the store are endless. Entertain with simple objects: I find that the simplest items in my purse seem to entertain my kids for the longest amount of time. They love putting on my chapstick, playing with my hand sanitizer container, opening up my wallet, etc. Keep your car keys on a clip, and clip them on to the cart. I don’t know why, but my kids love playing with my keys, and clipping them onto the cart ensure they won’t get lost. Use wet-wipes: Because I have small kids, I don’t go anywhere without a package of wipes. Hand each of your child a wipe and keep them busy wiping down the car, their hands, etc. Build towers: My daughter’s absolute favorite activity is building towers with items we have in the back of our cart. Involve your little shopper. 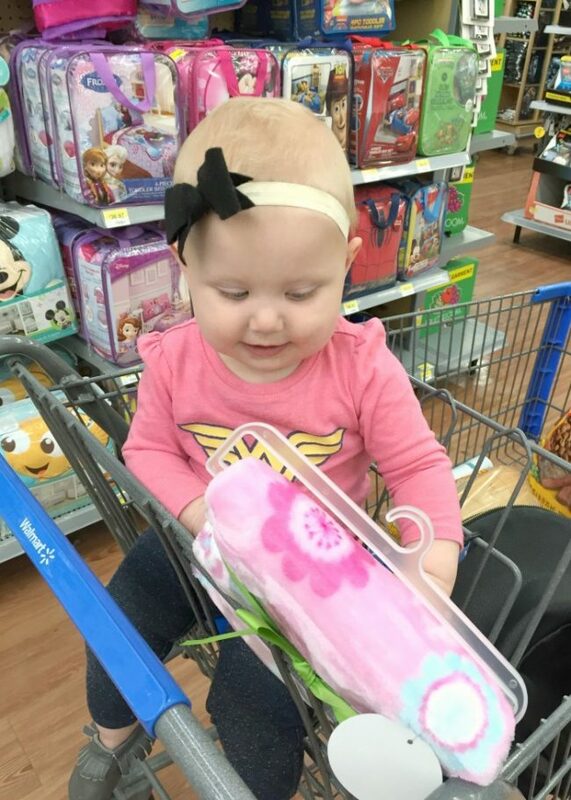 Allow your toddler to help you with tasks while shopping. Let them help you pick the apples, choose your weekly snacks, hand the groceries to the cashier, etc. Use Grocery Pickup. Want to know the absolute most enjoyable way to shop with kids? DON’T TAKE THEM SHOPPING! That’s right, do your shopping from your phone then have it delivered right to your car. 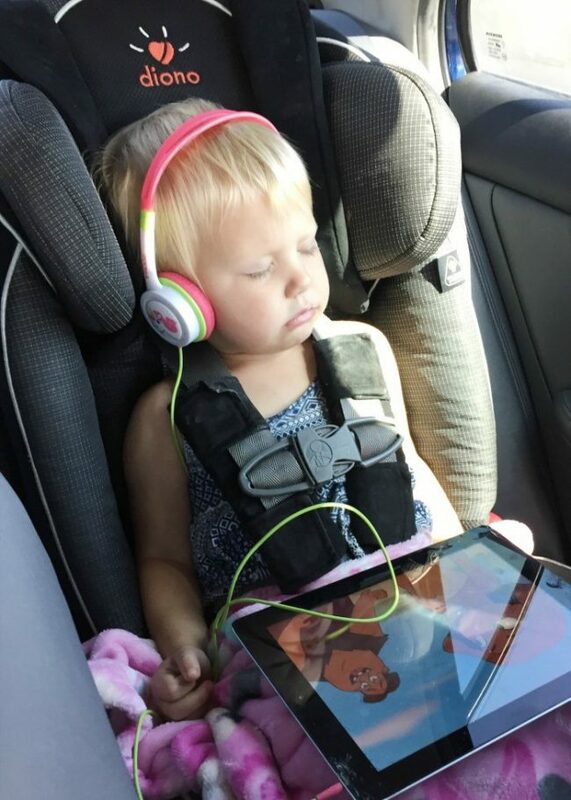 You, heard me, you don’t even have to unbuckle your kids from their carseat. How is this accomplished? Walmart’s Online Grocery Pickup. I heard about Walmart’s Online Grocery Pickup about a year ago and let me tell you, it’s changed my life. At first, I thought that there was a catch – as in, it seemed way to good to be true. But let me tell you, there is NO catch! No extra fee, no gimmicks, just groceries delivered right to your car. At the beginning of the week, I look online and choose my pickup day and pickup time. In order to hold your reservation, you must select at least $30 worth of groceries. You can continue to edit and make changes to your shopping list (even cancel if needed) up until the night before your grocery pickup. On your way to Walmart, all you have to do is check-in via the Walmart app (you can also call ahead) and a Walmart employee meets you at your car and loads up your groceries. I sit in my car sipping my soda while my kids are in their jammies (screaming their heads off, but no one can hear them) and my groceries are loaded into my car. Heavenly. Seriously, the most enjoyable shopping experience in the world. Why would anyone shop any other way? 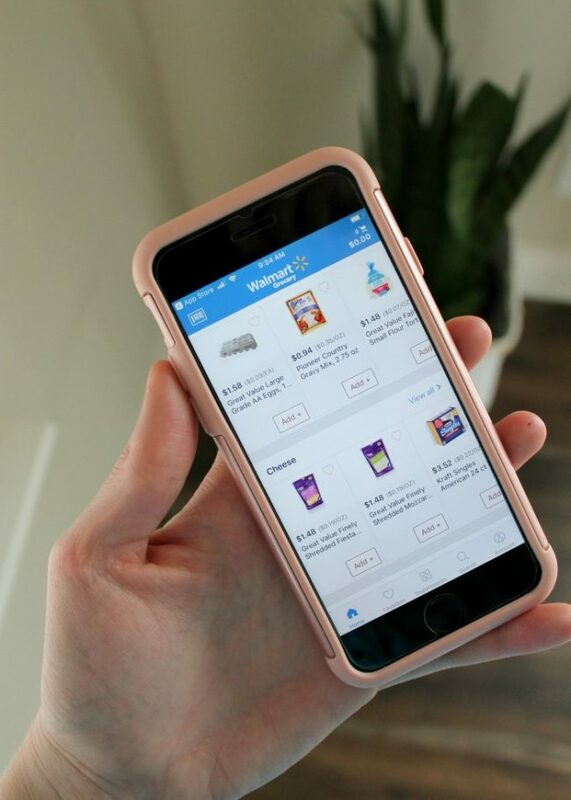 If you haven’t tried Walmart‘s Online Grocery Pick-Up, now’s your time! Use coupon code WOWFRESH for $10 off your first order. Shopping with toddlers has never been easier, thanks to Walmart’s Online Grocery Pickup. What do you love about Walmart’s Online Grocery Pickup? Oh boy these times seem like forever ago! Even though I don’t have toddlers anymore, my kids hate to shop with me so these are handy. These are all really fantastic was to go grocery shopping with your toddler. I love the tips. I am sure these are going to help many people. I haven’t tried this! This sounds so convenient! I will definitely check it out! Shopping with toddlers can be a big challenge. I used to pack snacks and my tablet for longer shopping trips. I remember those days! The cart was my best friend! My son would go nuts if I put him down! I could have used this a few years ago! My kiddos are past this stage but there were days back then I was pretty sure I was never going to get what I need to done with toddlers running around. Shopping with toddlers is a whole different beast than shopping with any other age group. These are great tips. I don’t envy you when you have to shop with little ones no matterhow prepared you are. These stories bring me back to when my kids melted down in public places. My daughter used to love to line up pens and pencils. I still have nieces and nephews that I sometimes care for so I will keep these tips in mind. Being prepared is a big one. I always found that the more I planned ahead, the better the trip went.